Geek, Nerd or Dweeb? : Today is Shundae :: I'm a Botak Head!!!!! Fridae :: Went to Muamalat, attended the training, didn;t go to Jumaat prayer, then went to Bangi for training.. as we're gonna have a match on Monday.. play, play and play then get tired. Called Yan, she was just get back from her hometown and tired.. I was a bit frustrated as she promised to go out with me to nite but then it's okay.. I'm getting more and more bored..
Then as I've got nothing to do, really bored, I headed home and make some calls.. then I decided to go back to Seremban.. easier.. nothing to worry and I can eat free for 2 nights and 2 days.. Packed all my things, removed the bedsheet, pillow sheet and the quilt cover, but I've forgotten that Tasha has already sprayed her perfume on my pillow earlier.. but my pillow was geeting much dirty and dirty, it was last replaced in the month of July.. haha.. but i think it's okay, i've always bathed before going to sleep.. and anyone would say that it's still clean and smells nice too!! Then slowly drove to Seremban, and in the middle of my way to seremban, which I was just passed Kajang exit, Yan called me and asked me where am I, I just said I'm heading to Seremban, and she asked why, and I answered I was so bored and got nothing to do.. hehe actually, Rina did called, was asking me out, Asha did too, so as well kak Wan to her party and so did Gee.. oh yeah.. Gee is a friend.. nice friend from Sarawak.. a new friend I met in Unkle Chili's.. but I just refused them all.. I'm bored to the max and need someone to talk to not going out with.. sometimes if I go out with them, they just talk their colleagues.. not me.. In Seremban, better.. i can talk to my Mom, even for 5 minutes.. I wanted to talk about something but I dun feel like to say it out now.. It's all about courting the right girl and courting it the right way as it is supposed to be.. My boss told me, if u wanna go all out, then go all out.. give her roses.. be as nice as you could.. he was as usual talking about his great old days.. hahaha.. so bored about it.. but he has points.. and maybe wanna talk about it with my mom.. but I just don't have any one yet to pick as my life partner..
Saturday :: The next day.. i wake up early, helped my father cleaning up the store room, and get things to be brought back to the village to be put in his car boot. Later, after sorted a few things out, as paying the astro bills, celcom bills, bought some groceries, I get myself ready for an UMNO meeting in Setiawangsa, Ampang. drove my sister's car.. slowly.. filled in RM 10 and drive to KL.. 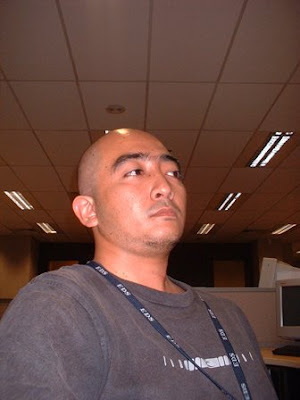 In the meeting, everyone I knew was like shocked seeing me bald.. Bob, Erein, Aboi, Sam, Kak Sid as well.. went throught the meeting.. it was the officiating the Puteri and Pemuda UMNO for that branch.. and I was elected for the Working Committee. How come.. I;m an outsider.. hehe.. but it's okay.. then headed home, then tried to call Yan again and she was still like wanna go out but she was having soemthing else.. so I think just for myself, I can save money tonite.. so.. I went straight back to Seremban.. watched TV.. there are so many TV programmes tonite..
Shundae :: woke up late as a result of fixing my sister's laptop.. had breakfast.. gosh.. this office is getting hotter and hotter.. I wonder how do they keep the computer inside here with this kind of temperature..
Then.. i checked out my car.. has not been moving for 2 days.. and here you are guys.. The dream-engine of NA-lovers.. 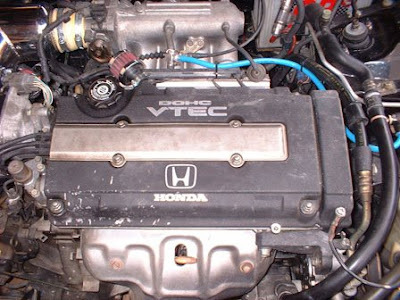 This is what some of us call as Big-VTEC.. Don't play-play huh.. 170 hp by standard.. pappaaaaa all the way.. 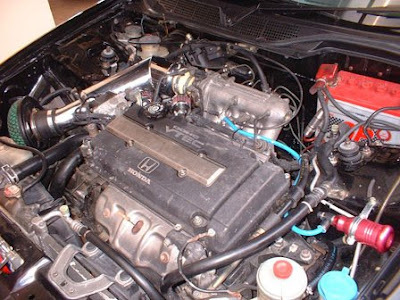 Prove.. this is the engine taken from an EK4 for Japan Domestic Market. 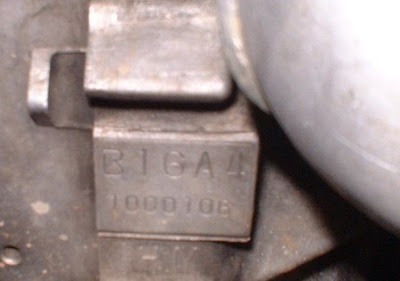 B16A4 is the engine code for the EK4 only in Japan.. go JDM go!!!! This is my engine bay.. Now it's equipped with HKS Air Filter, and vacuum controller.. I'm not sure what it is called.. but it's maybe a vacuum controller.. I was playing around with the vacuum controller.. At once, my car idling was up and down, just like having a high profile cam.. it sounds so KEWL!!.. but, being afraid of the possibility of high gas consumption, I tune it back to normal.. so no more external gas being absorbed to the injector while the RPM is lowing down.. In the office now.. getting a bit bored.. and hot too..